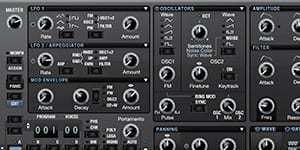 Discovery Pro is a 12 oscillator Virtual Analog Synthesizer featuring 4 layers, WAV and SoundFont (SF2) support, PADSynth, 2X oversampling / undersampling, built-in arpeggiator, sync, FM, 12 filter types, panning modulation, stereo delay and gate effects, graphic envelope modulation. Imports and exports Nord Lead 2 SysEx data. Discovery Pro archives even higher quality and features than his small cousin Discovery, retaining all previous functionalities. We spent countless hours of hard coding, design and engineering, bringing the best discoDSP team work in the form of a new instrument.